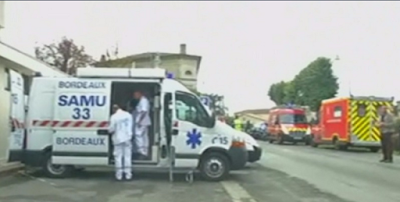 Forty two people died when a bus collided head on with an on coming truck near Bordeaux early Friday morning, officials said. According the french police, most of the people who lost their ives were the elderly, who were traveling to a different location. Another five people were injured in the collision. An official from the the French interior ministry said that the passengers were French and were from that region. President Francois Hollande said in a statement that he had been "plunged into sadness by the tragedy"
The bus is said to have been carrying more than 50 day -trippers south to Landes area from their home called Petit Palais a few miles from the crash site. Speaking to local TV station BFM, a member of parliament from the region said over 90% of them were elderly living in a home. According to statistics, road deaths in France have fallen steeply this year and they have recorded an all time low since the 1970s. from about 16,000 in 1970 to around 4,000 in the recent years.